Here is how a few street artists have wished yuletide greetings to anyone who tears their eyes away from the bright lights and window displays to observe their seasonal street art. Inkteractive has gone a little bit robust with the fond felicitations, lets hope the weather is a good as captured in the instamatic polaroid pic. The MisFortuneTeller has a new business line selling Christmas Unicorns as the healthy alternative to Turkey, bloody GM research! Some artist really entered into the Christmas spirit by placing free art out on the streets as lovely stocking fillers for the eagle eyed. On Christmas Eve a lovely Sean Worrall piece found a new home, this one seemed to be some kind of “re-issue” or a rare “number error” piece, the Sean Worrall equivalent of a Penny Black! Inkteractiv also left a lovely framed Xmas gift on the street which Santa should now be conveying to North Carolina if all goes to plan. Finally, all that remains is to wish all a Happy Christmas or Seasonal Greetings as appropriate and best wishes to all for the New Year. This entry was posted in News and tagged Benjamin Irritant, Christmas Art, found art, free art, Inkteraktiv, London, Sean Worrall, Shoreditch, Street Art, Streetart, Tour, Xmas art on 12/25/2018 by Shoreditch Street Art Tours. Spring half term holiday has just finished in the UK and Shoreditch Street Art tours was busy. On Monday as a group admired the work in the car park behind the old Seven Stars Pub a car screeched into the yard and, like some kind of artist tardis, a dark door opened and out came a street artist and a load of working materials, Fanakapan spent the week progressing a massive dual aspect mural outside Magna on Brick Lane. On Saturday, our tour guest Alicia managed to get a wonderful souvenir, a Fan tag on her shoulder bag. Among other artists busy creating new artworks that we had the pleasure of encountering were Mr Cenz and ThisOne. Several pieces of Free Art were found, firstly this lovely framed art drop by Sean Worral was discovered in a wall in Shoreditch. Then at the end of the week, two Free Art Friday art pieces by Ninja Grl were discovered at basically the same location. 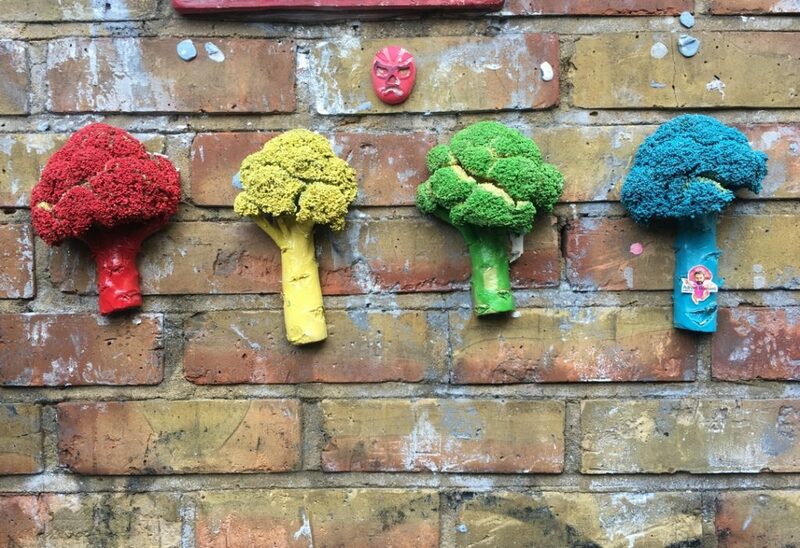 At the start of the week Adrian Boswell, the Broccoli Man, put up a new four piece broccoli rainbow installation. As the week started chilly and as the broccoli aged, the florets started to wilt and open. Then some strange interventions took place as the broccoli moved around like some strange game of chess was underway before being chopped into smaller pieces. 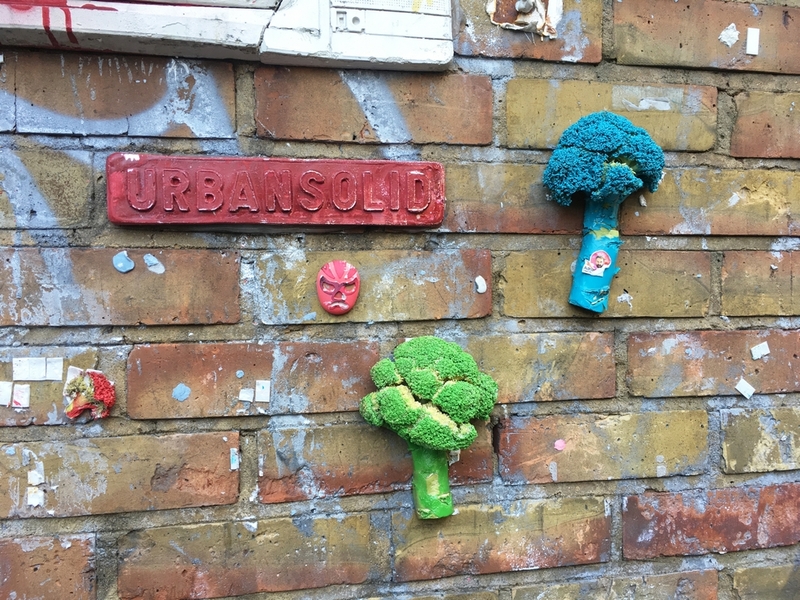 More about the broccoli street art on this recent blog post. Life Is Beautiful’s Dark Wings photo opportunity, covered earlier in the week HERE, gradually decayed over the week as more and more tags accumulated but guests persevered, making the best of the opportunity to photograph some nice interactions with the work. Then on Sunday morning, boom! Still smelling of fresh paint we found that the dark wings had been restored, as Life Is Beautiful noted they had nine lives. Half term flew past with lots of fun and a load of great street art in Shoreditch as usual, thanks to all the guests and all the artists who make it such a wonderful week. This entry was posted in News and tagged Adrian Boswell, broccoli man, Fanakapan, found art, free art, half term, halfterm, holidays, London, Mr Cenz, school break, Shoreditch, Street Art, street artists, ThisOne on 02/20/2018 by Shoreditch Street Art Tours. It was a gorgeous sunny day in Shoreditch today and a very special bunch of flowers came into bloom. Artist Sean Worrall is renown for his generous distribution of free art in various parts of London and indeed occasionally even further afield. A leaf bloomed against a backdrop of art by ThisOne and came into the possession of the delightful Josephine. Josephine was the youngest member of our tour party this morning and she was delighted to collect leaf #169 of 365. The next garden delight I didn’t even see myself, apparently I was babbling on a bit at the time but eagle eyed Amelia spotted #165 of 365. 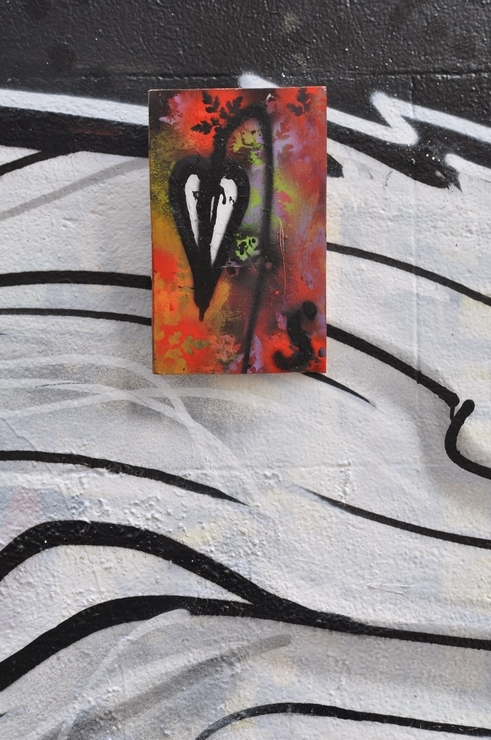 As we walked through the Wheler Street Tunnel Jean, who gallantly surrendered the first leaf to Josephine on account of him being a gentleman had his virtue rewarded when he found this gem, simply marked #43artdrop. The fourth leaf to yield itself to the tour group was spied by Clare whilst I was busy preventing guests throwing themselves in front of cars and bikes on Bethnal Green Road. It is a wonderfully beautiful gesture by Sean Worrall to place these free pieces art out on the street to await their fate and we are delighted to report that this cluster of four have all gone to very appreciative homes. The numbering of some of the works of art found today is interesting as in 2015 Sean Worrall embarked on a project to place 365 pieces of art on the street, one for each day of the year. At the successful conclusion of that mission he wrote about his purpose in that project and this beautiful and moving story by Sean showed how it touched people’s lives, definitely worth a read. This Sunday (9th July 2017) Sean will have one hundred pieces, one hundred paintings on recycled cardboard, each to be sold at a price of £1 at the 2017 Art Car Boot Fair in Vauxhaul, one of many great reasons to head over there. This entry was posted in News and tagged #365ArtDrops, found art, free art, leaf, Sean Worrall, Shoreditch, Street Art on 07/07/2017 by Shoreditch Street Art Tours. Finding Free Art is a frequent occurrence on the Shoreditch Street Art Tour and today we came across a lovely plate by Heavens Rejects with a hand painted demonic worm asking the open ended question “Why Not?”. Why not indeed thought birthday girl Ellie as she pounced on Heavens Reject’s gift to the fans of street art. Ellie was celebrating a very very special event, it is her 21st birthday today, congratulations Ellie. Her celebration with family and friends included a tour with the Shoreditch Street Art Tour and is if that wasn’t enough excitement, a special day became truly great when she became the proud and lucky owner of Heavens Reject’s Free Art gift. In case you weren’t aware, Free Art is art left on the streets by street artists which they intend some lucky person to take home with them. Heavens Reject had evidently been busy, we located several stickers and at least two kinetic spring mounted pieces of art all added to the streets since yesterday afternoon. Heavenly rejects has been placing interesting one of pieces of art around Shoreditch for quite a while, although I couldn’t photograph all of them (I was guiding guests on a street art tour after all! ), here is a small selection of art pieces with his trademark devil character created in the past by Heavens Rejects. This entry was posted in News and tagged Dee One, found art, free art, Heavens Rejects on 02/27/2016 by Shoreditch Street Art Tours. 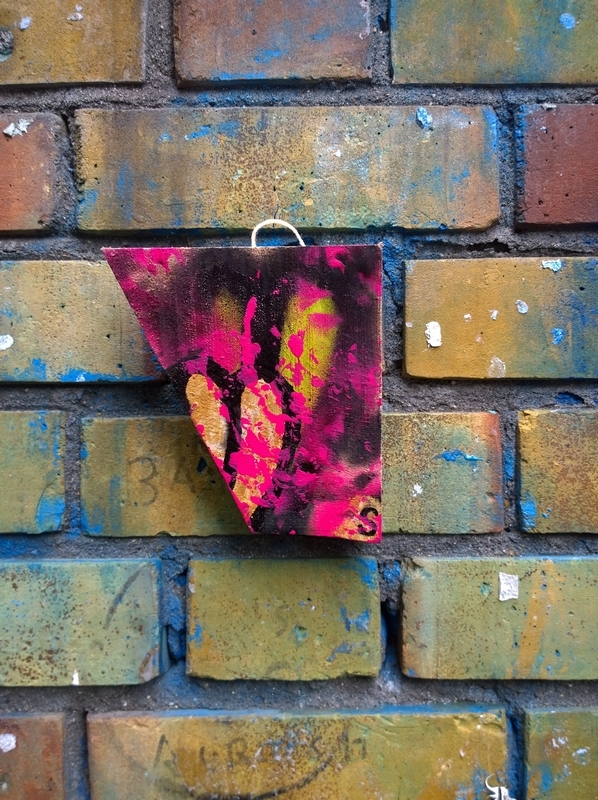 Artist and gallerist Sean Worrall devoted a huge amount of energy in 2015 to a project he called #365ArtDrops, leaving painted art on found materials on the streets for people to find, keep and treasure. Quite a number of guests over the year had the good fortune to finish the tour clutching a chance find piece of Sean’s art. Today we had an echo of that joy. Sean has a new project #43. Sean’s information page says: “#43 will be a new piece from Sean Worrall consisting of 43 parts and revealed somewhere in London on the 43rd day of 2016.”. The 43rd day of 2016 was last Friday, Ingrid and Raja spotted this free art on Brick Lane today, they knew a good thing when they saw it and claimed it immediately. How nice that their piece is number 1 of the 43. As guests on the Shoreditch Street Art Tour collected Sean’s free art over the passage of the year Sean’s project featured quite often here on the blog, you can share in our reminiscences on those older stories HERE. This entry was posted in News and tagged #365ArtDrops, #43, Art, Artist, found art, free art, guests, London, Shoreditch, Street Art, Tour on 02/14/2016 by Shoreditch Street Art Tours.